Alongcamepollly: Rapunzel, Rapunzel, let your hair down.. My extensions experience..
Rapunzel, Rapunzel, let your hair down.. My extensions experience.. 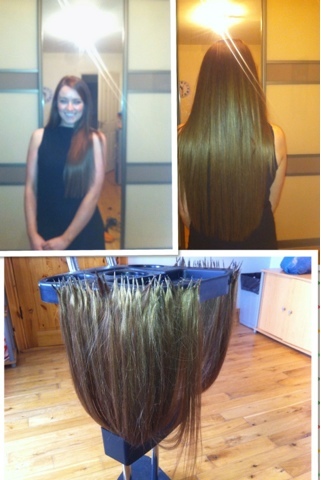 I won an amazing prize in June where I got a full head of human hair micro bead extensions, that would last 3 months, with maintenance and after care included. It was the best prize I have EVER won. I have naturally very very fine wispy hair and I always wanted extensions but thought it would ruin my hair after they were taken out. Trish in Excel Hair assured me that because glue isn't used in the micro bead method there would be little or no damage done to the hair. So I went to Trish's house for the big day and was greeted with an array of treats.. Champagne, strawberries and dipping chocolate sauce, and a few bottles of coors light, I was in my element! The extensions took 6 hours to put in, yes, this does sound like a very long time, but we were chatting so much the time actually flew. When she was all done I stood up to have a proper look at my new hair, it felt so heavy, it was so weird! But it was just so unbelievable, they looked so real, so shiny and soft without any trace of my real hair. So I went home that night with a few key rules: use a gentle natural shampoo, only use the extension brush with the occasion use of a tangle teaser brush, wash hair every 3 days, plait the hair at night, and-this was my favorite rule- sleep on a silk pillow. A silk pillow. Well if I didn't already have notions about myself I sure as hell have them now! There is a common myth that extensions are very high maintenance, but I honestly didn't find it that way at all. I washed them with gentle shampoos and conditioners such as Balmain Paris, Argan Plus, Joico, and a great pack I bought in the Hair & Beauty supplies in Galway called 'X-10'. After washing the hair I tried to let it dry naturally whenever possible, sprayed loads of leave in conditioner and brushed it when completely dry. The hair I had was great because it had a natural kink like my own hair so it looked so natural. At night I plaited the hair so it didn't tangle which was great because my hair was curly the next day so I never really had to use straighteners. I never had any problems during the three months, I saw Trish every month so there wasn't alot of damage I could have done in a month! When they were starting to grow out there was a bit of knotting at the root where the hair was growing but you couldn't see it at all and I couldn't feel it. I could tie it up as normal and after a week of getting them in I couldn't feel a thing. I got them removed last Friday it only took an hour and a half and it was a tiny bit sore but more so just the pain of losing my long hair! :( I felt so much lighter after and found it so hard to get used to the thinness of my hair..But I was more concerned that I would be left with even less hair than before, but this wasn't the case my hair has never been in better condition. For three months I used the best shampoos, rarely used heat and straighteners and really looked after my hair. So anyone thinking of getting them in I would say go for it, you'll feel amazing and there won't be any hair scares once they're taken out, but I would go to Trish in Excel Hair she is so amazing at what she does and went above and beyond to ensure I had the best experience possible. God it took me a lonng time to get to the point, apologies I'm SO TIRED. Anyway off to bed I go, I'm getting old, 10.30?